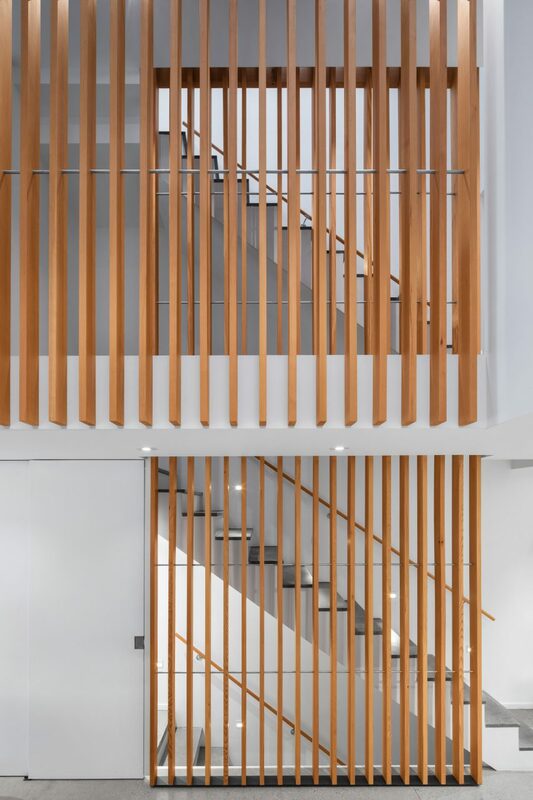 An atrium ringed with wooden slats and topped with netting is the focal point of this slender Montreal dwelling, which has been overhauled by Canadian studio Robitaille Curtis. 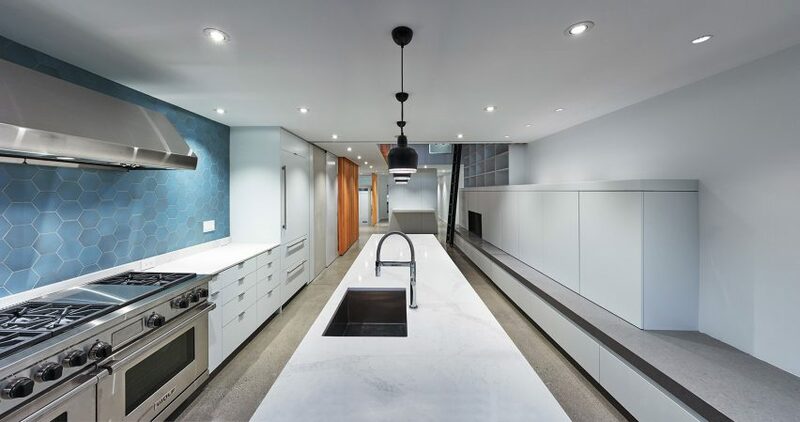 Located in the city’s Westmount neighbourhood, the Atrium Townhome project involved a major revamp of a narrow, rectangular home that was cramped and outdated. Robitaille Curtis, a local firm, sought to open up the home and create a more contemporary look. 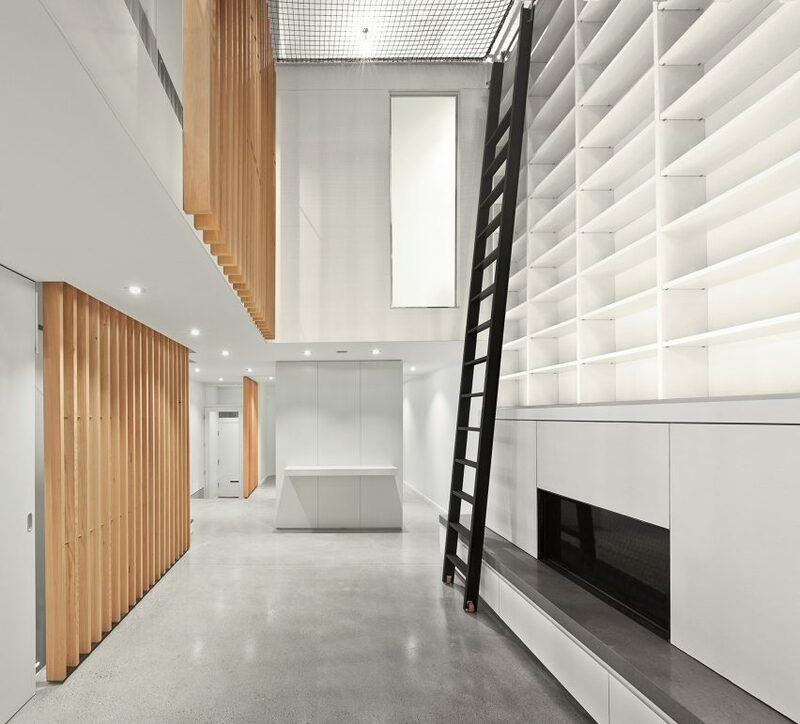 Particular attention was given to a 9.7-metre-high atrium at the centre of the dwelling. “Our design embraces this feature and heightens the experience of its dynamic interior volume,” the studio said in a project description. The most dramatic move entailed stretching a trapeze net across the top of the atrium to create a children’s play area. Riggers from Canadian entertainment company Cirque du Soleil provided and installed the netting, which is level with the floor slab. 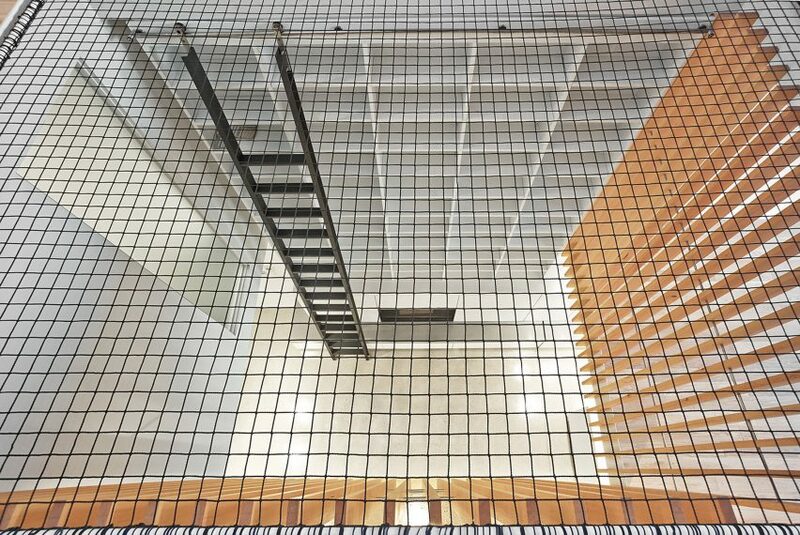 “The use of a net in this location precludes the need for guardrails and opens the floor plan to unimpeded views to and from the third floor,” Robitaille Curtis said. At the base of the atrium, the team added a modern black fireplace, which overlooks the dining room. Above, a large white bookcase is accessed via a 5.5-metre-tall steel ladder. 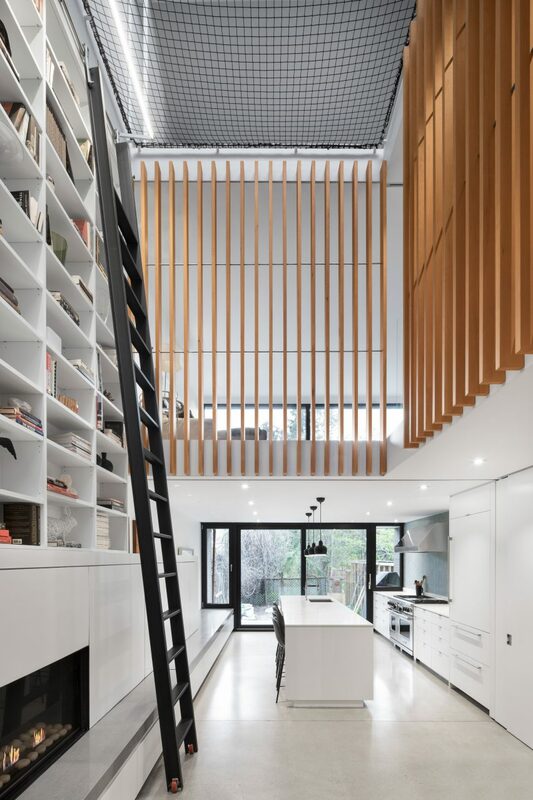 In addition to providing storage space, the shelving adds visual interest to the atrium and draws the eye upward. 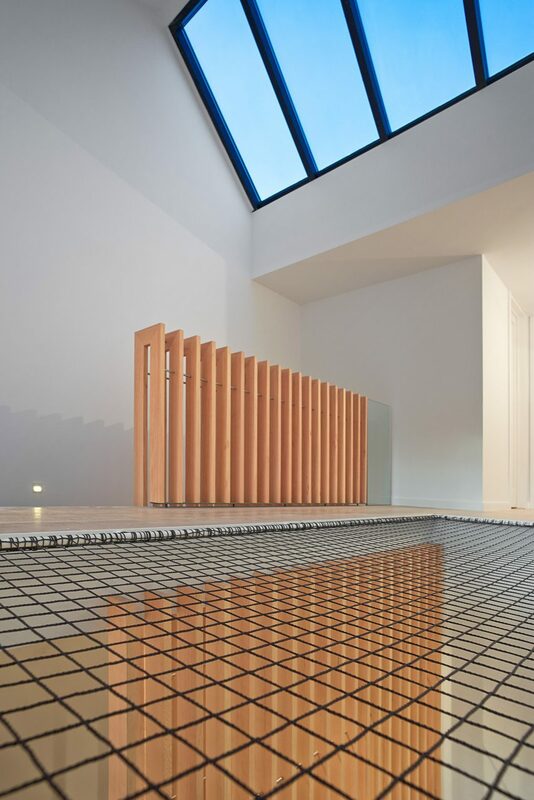 On both the ground and second levels, slats made of vertical-grain Douglas fir surround the light well. The wooden screens give the void a sense of enclosure, while also serving as guardrails. Beyond the atrium, the team reconfigured rooms to create a more open atmosphere. On the ground floor, the kitchen was relocated from the front of the home to the rear, where glass doors open onto a covered terrace and newly designed garden. Also on the ground floor, a wooden unit called “the cube” was placed between the atrium and the living room. Acting as a spatial organisation element, the cube helps guide movement through the ground level. It also houses a closet, a small bathroom and pocket doors. Throughout the home, the team used a restrained palette of colours and materials. Wood is paired with concrete floors and white lacquered cabinetry, which combine to “create a crisp, clean and warm” ambiance. Robitaille Curtis was founded in 2013 by landscape architect Sophia Robitaille and architect Andrew Curtis. Other projects by the studio include a renovated Montreal kitchen the features grey cabinetry, brass accents and ash flooring, and a cabin in the Laurentian Mountains that sits atop wooden pilotis. Photography is by Adrien Williams and Marc Cramer.